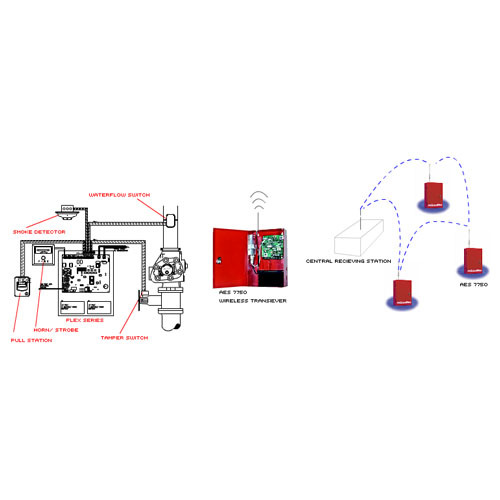 A Sprinkler Monitoring System is a basic conventional fire alarm package that consists of all the necessary devices to monitor a Sprinkler System by a UL Listed Central Station. This system is the minimum code requirement of many facilities that have sprinkler systems, such as warehouse and strip malls. Some facilities do not have a reasonable method providing phone lines to the monitoring Fire Alarm System. In this case, a Wireless Radio Dialler can be installed in lieu of conventional phone lines to provide the communication between Fire alarm and the Central Station. These diallers are UL listed and approved by the Fire Departments. They utilize signal towers located throughout the metroplex for data transfer.